The harbour town with no future? The time has not past for sensible people to talk sensibly to save the port. The Folkestone-Boulogne route was popular with tourists and travellers. The year before James Sherwood the President of the Bermuda based company Sea Containers Services Ltd., obtained the Port of Folkestone in July 1984, as shown from the 2,119,653 passengers that used the Folkestone-Boulogne services in 1983. The cross-channel car-ferry services were removed so that he could to sell off the harbour land to property speculators for a Harbour-Village 'masterplan' of 1989. Mr Roger De Haan, the former chairman of Saga, bought the port off James B. Sherwood, on 2nd July 2004. In August 2004, the linkspan and other vital essential ferry service operational facilities and infrastructures at the Port of Folkestone were removed. In the Shepway District Council local plan it is stated that “The Council wishes to protect the potential for a cross Channel passenger ferry link with the town of Boulogne”. Why did Shepway District Council officers and councillors and the Member of Parliament for Folkestone puttingall the local economy on the road to wrack and ruin by allowing the owner to destroy all of the port’s operational facilities all the potential for the Cross-channel ferry services to return? 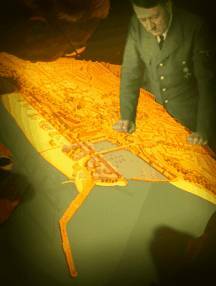 “Seelöwe”, Adolf Hitler's ‘Masterplan’ drawn up plans for the harbour town of Folkestone, but failed to destroy Britain’s maritime bulwark. However James B. Sherwood and Roger De Haan have achieved more destruction to the Port of Folkestone than German High Command could achieve during WWII.- The Spirits that fought the foe then, need to be raised up once again, to Fight the Foe. Why did the local councils and MP allow this to happen? Click here to see the British Pathe Newsreel on the 1962 Folkestone to Boulogne Boat Train Ferry Services.